Birna's Oddments is a general goods store in Winterhold. 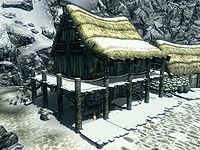 It is a two-story building, located between the Jarl's Longhouse and Kraldar's House and is home to Birna and Ranmir. It consists of only one zone, which is the interior of the building. There is a row of pillars supporting a balcony at the front of the building and stairs up to it at the rear, to the right of a chicken coop containing a single nest. The main entrance leads directly into the shop, with the counter on your right, in front of the north wall. Birna spends her day standing behind the counter. The first time you interact with her she will offer to sell you the coral dragon claw for 50 septims. There are several barrels and sacks of foodstuffs around the building, but no displayed merchandise in the shop. Once you have completed the relevant quest you will be able to take all low-value items freely from the shop and residence upstairs. Opposite the entrance is a fireplace with a cooking pot in front and a mammoth tusk on the mantelpiece. To the right of the fireplace is an unlocked display cabinet containing two each of petty, lesser, and common soul gems. Above this are three rabbits hanging from a rack attached to the ceiling, two garlic braids, two bunches of dried elves ear and a bunch of dried frost mirriam. On the counter is a medium coin purse, four loose septims and a bottle of wine, while under the counter is a copy of Dunmer of Skyrim, a small coin purse, a lute and an iron dagger. Against the north wall is a cupboard holding two bottles of alto wine, three bottles of wine, and eight bottles of Nord mead. To the right is a set of shelves holding two potions of minor healing, a potion of minor magicka, a potion of regeneration, a potion of resist fire, two flutes, a bowl, a cabbage, six potatoes, and several cheese wheels. Against the east wall is a narrow wooden table with an Orcish dagger on top. To the left of the fireplace is a rack hanging from the ceiling holding four pheasants, with a set of shelves to the left of that, holding an iron mace and a drum. Against the south wall is a flight of stairs up to the top floor, with a couple of crates and a woodcutter's axe under the stairs. Upstairs, against the west wall, is a long wooden table and bench, with three bottles of alto wine, two fillets of salmon meat, a chicken's egg, two bulbs of garlic, a couple of loaves of bread and several wedges of cheese on the table, and a loaf of bread on the bench. To the right is a small round wooden table and an unlocked chest containing leveled items, with two more bottles of alto wine and five loose septims on top of the table. Coming out from the middle of the north wall is a large double bed with a dresser on either side, both containing clothes, with a copy of the Destruction skill book Mystery of Talara, v3 on top. At the foot of the bed is another chest also containing leveled items. Above the stairs, against the east wall, is a set of shelves, but they only hold clutter, with a door out onto the balcony to the left. This is the merchandise found in Birna's merchant chest. These items are only available if purchased from the merchant; they cannot be pickpocketed or stolen. They are restocked every two days. With the exception of some barrels and sacks, all containers in the area are non-respawning and safe to store items in. The display case lid collides with the rabbits above it when opened (resulting in humorous motion on the part of the rabbits). The key to the store is named Key to Ranmir's House and is carried by both Ranmir and Birna. This issue has been addressed by version 1.3.0 of the Unofficial Skyrim Patch; it renames it as the Key to Birna's Oddments.